At the end of a long, good conversation this morning, I stumbled into a thought I want to share with you. We were talking about the irony that those of us who desire more of church/Christian community are often the ones who find the least of it in our lives. Yes, we look at other forms of church and know they fall short of the ways Jesus describes walking out our faith together. And yet, we are no better off. We desire relationships with vulnerability. We need people to walk the ongoing walk with us – sharing in moments of high and low, and all the mundane working it out in between. We want people to laugh with us, to cry with us. Other people to care about and help with our kids. Friends to pray with and that we can call when our car batter dies and we need help. We want Jesus-filled community. I would suggest that this doesn’t come without commitment. Not commitment to a set of beliefs or a particular way. Rather, its commitment to one another in Christ – a deep, unique type of relationship that doesn’t require we are all the same. Its saying our expectations of one another and being ok when they differ, not making you be what I want you to be. Because the point is each of us being who God wants us to be. And we can be that best together! 3. The enemy is actively working against this – because isolated Christians, isolated people, are forced to give up on what is right, or try to do it on their own. It’s been a strategy from the very beginning – keep them apart and they aren’t powerful. I want to choose these. We don’t do these to be church. But in living this way, we are church. Love God, love others, love one another. Help others do the same. Seek God’s Kingdom. Journey together, mission together, be who you are meant to be together. Its not meant to be fancy. It is meant to be freeing for everyone. I want that. I need that. I’d like your help to live that. Why are Christian NGO’s/non-profits mostly staffed by women? 1. Women who are called and gifted to lead in ministry are not allowed to do so by their church, so they need another venue to serve. 3. Women find that NGO’s allow them to pursue a passion God has put on their heart. Men, too often, are also concerned with building their own little empires of significance – something the mission-focus of NGO’s tends to work against. to take the day off for a Christian holiday – indicative of the religious climate of Cape Town. I have never celebrated Ascension Day. I am aware of the meaning, but I come from a “Christmas and Easter and every day in between” background. So, no Ascension Day, Pentecost, Epiphany, etc. This is an important part of Jesus’ story – and ours. The sending of the Holy Spirit is the birth of the Church, the empowerment of God’s people, the spread of the Kingdom. That’s all Pentecost (which we celebrate soon). 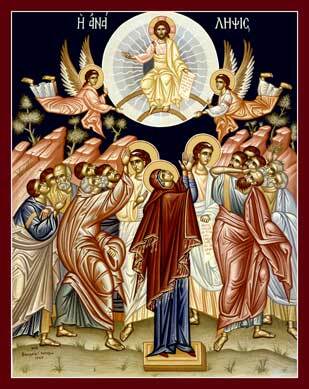 But Ascension Day is more than just a setup for Pentecost. Jesus ascending to heaven is hugely significant. Two reasons jump out at me. Jesus, having ascended, is now seated at the right hand of the Father. He was with God in the beginning and now has gone back to his rightful place of authority over everything (the one he gave up for us in his incarnation). And what is he doing on that throne? He is speaking to the Father on our behalf (Romans 8:34, Hebrews 7:25). Can you picture the Father and Son sitting there speaking about how much they love you, watching what you are doing today? I believe he is also still putting in appearances here on earth. Literally. Revealing himself to people, helping, inviting, saving. makes all the difference in HOW we live. All the gifts, power, and authority that come from the Holy Spirit are useless if we don’t start from a place of intimacy with God, shaping our hearts to live well. Intimacy shapes our identity so we can live with authority. How much have you considered Jesus’ Ascension? What do you think Jesus is up to these days? What would be an appropriate way to celebrate the Ascension?